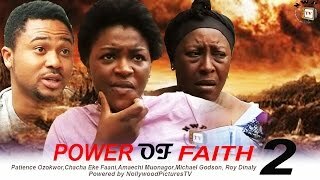 If you have already seen Part 1, then continue watching in Power of Faith Nigerian Movie [Part 2] also showing on Nigeria Movie Network. The religious drama stars Patience Ozokwor (Mama G), ChaCha Eke, Amaechi Muonagor, Michael Godson, Adamma Luke, and Roy Dinaly. Video made possible courtesy Nollywood Pictures TV! Watch, comment and share with friends online! According to NollywoodPicsTV, this is a movie that exhibits a lot of creativity and the artists have shown some entertaining prowess. Movie Storyline: Ikem (Michael Godson) a young businessman finds himself visited by a strange illness that paralyzes him from head to toe, after barely recovering from armed robbers attack. His parents in a confused state and desperate to have his lineage continued, gets a pregnant girl to be married to him.This act gets the story going to a very interesting and gripping direction that will definitely keep the audience at the edge of their seat.